rec. October 2015, Auditorium San Rocca, Senigallia (Ancona), Italy. 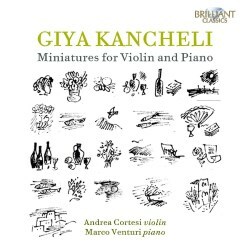 This première recording of Kancheli’s Miniatures is quite a coup for Brilliant Classics, revealing as it does a different side to the Giya Kancheli who normally presents much larger musical canvasses via the ECM label and elsewhere. Not everything is gentle, and the jazz and dance elements that hit home in something like Miniature No. 6 or 11 generate plenty of contrast and a grand sense of wit and all the fun of a slightly edgy circus, or even a Brechtian cabaret with Miniature No. 15. The violin is explored in pizzicato and other techniques such as flageolet tones, throwing melodic ideas into different areas of character, which is an important consideration when tempi are often slow and ruminative. In all, there is an aura of magic around these pieces which is quite compelling. The final Rag-Gidon-Time is another piece derived from the theatre, a strangely halting dance filled with silences and dynamic explosiveness, its title also alluding to the dedication to Gidon Kremer which applies to all these pieces. With the musicians placed in a pleasant acoustic but balanced with plenty of detail this is an excellent recording and worth every penny of its budget asking price.